In Chinese cuisine, there are some good combinations. Fish and tofu are one of them. Both fish and tofu contain Calcium. One is animal protein and another is plant protein. This combination will promote the absorption of Calcium and protein. The soup is fresh and fragrance. The fish is tender and tasty. The tofu is soft, tender and with fish flavor. Actually tofu is more tasty than that fish. 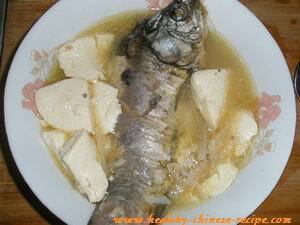 In China we always use crusiancarp as this fish has medicinal effect. But it has many small bones. Most westerners are afraid of fish bone. You can choose tilapia which only have a big bone. Then throw away after eating. Or you can use boneless fish blocks. It's delicious too. Marinade fish in Marinade Sauce for 15mins. Drain well. 2. Cut ginger and scallion into flakes; Chop garlic. Cut radish into strips. 3. Heat oil in a wok, arrange ginger flakes one by one on the bottom of the wok. Place the fish on the ginger. Turn to low heat. Pan fry for 3-5 mins. Turn the fish to another side, pan fry for 3-5mins. 4. Add White Sauce, sway the wok, let the fragrance comes out. 5. Add hot water or stock, almost cover the fish. Add radish strips. Turn to high heat, bring to a boil. 6. Spoon a thin block of tofu by using a tablespoon, place in the wok. Repeat till all the tofu are placed in the wok. 7. Turn to medium-low heat, simmer for 20-30mins with cover. 8. Before turn off heat, better take a taste. Usually I add additional salt, or wine, or vinegar according to my taste.Then boiling for additional 5mins with medium-high heat. 9. Turn off heat. Let it stay with cover for 5mins before serve. 10. Pour out to a big bowl. Take out ginger and scallion. Assign to small soup serving bowls. Serve. * Taking out the smell line can remove the fish smell. There are other ways to remove fish smell: Apply wine, vinegar, or milk. Ginger reduce fish smell too. Fish and seafood live in water. They are cold and contain Yin Qi. Ginger wine, garlic, scallion are warm and contain Yang Qi. Using these seasonings adjust cold and warm, keeping Yin Yang balance when cooking fish and seafood. They remove fish smell as well. 2. There is a principle when cooking soup. Don't always bother it. Soup is the soul of food. Eating soup is absorbing the Qi of food while eating food is eating its flavor. This means that soup is the elite of food. So we must give food itself enough time. 3. According to 2, add enough water one time. 4. Boiling in high heat before turn off heat will produce milk-white soup. Serve as main dish at lunch or dinner. Eat fish and tofu,drink soup. Beneficial Function: Contain high quality protein,easy to be digested and absorbed,suitable for those who are with hepatitis,nephritis,hypertension, cardiovascular and cerebrovascular disease. 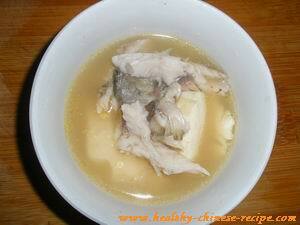 Crusiancarp soup is always used for women in maternity period,or other patients who feel very weak.